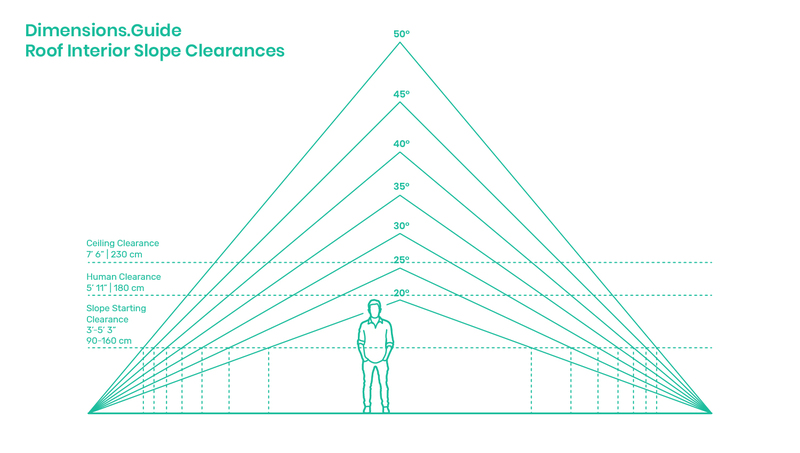 Interior clearances for roof slopes provide guides for designing functional human spaces under the challenging constraints of angled roof planes. With various angles ranging from low slopes of 20° to extremely steep pitches of 50°, roof slopes restrict the amount of usable space based on comfortable heights of standing people. It is advised that ceiling heights be designed at a minimum of 7’6” | 230 cm with minimal human clearances set at 5’ 11” | 180 cm. To provide for more functional space around the perimeter of a sloped roof, starting heights of 3’-5’3” | 90-160 cm should be provided at the base of the slope to accommodate a range of diverse functions and furniture options such as chairs, desks, low beds, and storage.